WELCOME...to your source for affordable, high-end creative audio and video production. 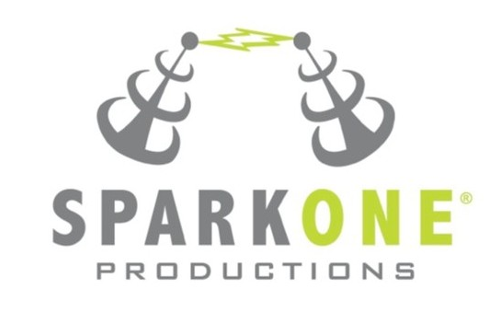 Whether you're a BUSINESS OWNER looking to advertise, or a RADIO SALES EXEC looking to up the quality of your client's message, SPARK ONE PRODUCTIONS gives you award wiining service! COPYWRITING: Put 30 years of copywriting experience to work for you! Give us your ideas to bring to life, or let us create something for you. Try to give at least 24 hours notice for a copy request, but same-day service is available if necessary. Price will be determined by length, level of creativity and number of spots needed. SPOT PRODUCTION: From casting to final approval, your radio spot will be produced to your exact specifications. Production costs are determined by studio time and talent fees. Licensed music and sound effects can add additional costs. Quick turnaround is always possible, but please allow for time to produce more complex projects. SONIC LOGOS: Sonic logos can be the client’s slogan, the name of the business, a musical sequence, sound effects or some other related idea developed into a short pneumonic that appears in or tags the spot. (an example would be Farmer’s Insurance: “We Are Farmers! Bum bitty umbum bum bum BUM!”) These can give added ROI to a client in identity building and branding. Costs are determined by studio time and talent fees. JINGLES: We'll work with you to choose the musical style that best suits your businesss' identity and develop lyrics that best reflect your message in song. Then our talent pool of musicians will work to create a piece of music that is particularly yours and yours alone. Cost are determined by composition time, studio time and talent fees. PRE-ROLL: We can take your logo, stock photos or footage, add graphics and create a video spot that can greatly expand the reach of your message. If you're a sales exec this can be an added incentive for clients, or if you're the business owner we can work with you directly. Costs are determined by copywriting, studio time and talent fees. Videographers, music licensing and sound effects can add additional costs. SOUND DESIGN: Well executed sound design can make any piece of video stand out from the crowd. Creative sound effect and music placement can greatly increase the impact of your spot or project’s soundtrack. Send us your footage and we’ll make it sound great! Cost is determined by studio time. Music licensing and sound effects can add additional costs.